MASVINGO, Zimbabwe, Jun 25 2014 (IPS) - As the villagers sit around the flickering fire on a pitch-black night lit only by the blurry moon, they speak, recounting how it all began. They take turns, sometimes talking over each other to have their own experiences heard. When the old man speaks, everyone listens. “It was my first time riding a helicopter,” John Moyo* remembers. So started the long, painful and disorienting journey for the 70-year-old Moyo and almost 18,000 other people who had lived in the 50-kilometre radius of Chivi basin in Zimbabwe’s Masvingo province. When heavy rains pounded the area in early January, the 1.8 billion cubic metre Tokwe-Mukosi dam’s wall breached. Flooding followed, destroying homes and livestock. The government, with the help of non-governmental organisations, embarked on a rescue mission. And even unaffected homes in high-lying areas were evacuated by soldiers. According to Moyo, whose home was not affected, this was an opportunity for the government, which had been trying to relocate those living near Chivi basin for sometime. “They always said they wanted to establish an irrigation system and a game park in the area that covered our ancestral homes,” he tells IPS. For Itai Mazanhi*, a 33-year-old father of three, the government had the best excuse to remove them from the land that he had known since birth. “The graves of my forefathers are in that place,” he tells IPS. Mazanhi is from Gororo village. 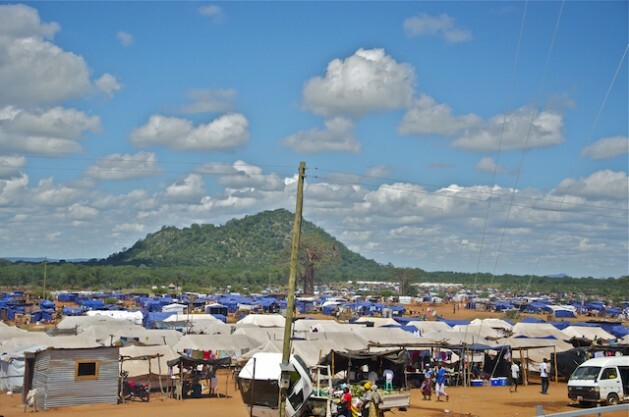 After being temporarily housed in the nearby safe areas of Gunikuni and Ngundu in Masvingo province, the over 18,000 people or 3,000 families were transferred to Nuanetsi Ranch in the Chingwizi area of Mwenezi district, about 150 kms from their former homes. Chingwizi is an arid terrain near Triangle Estates, an irrigation sugar plantation concern owned by sugar giant Tongaat Hulett. The land here is conspicuous for the mopane and giant baobab trees that are synonymous with hot, dry conditions. The crop and livestock farmers from Chivi basin have been forced to adjust in a land that lacks the natural fertility of their former land, water and adequate pastures for their livestock. The dust road to the Chingwizi camp is a laborious 40-minute drive littered with sharp bumps and lurking roadside trenches. From the top of an anthill, a vantage point at the entrance of this settlement reveals a rolling pattern of tents and zinc makeshift structures that stretch beyond the sight of the naked eye. At night, fires flicker faintly in the distance, and a cacophony of voices mix with the music from solar- and battery-powered radio sets. 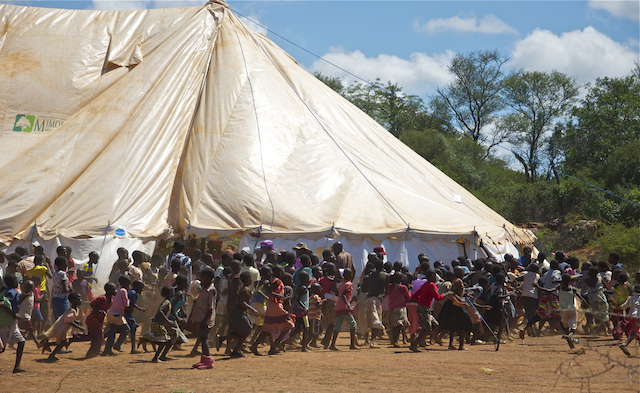 It’s the image of a war refugee relief camp. A concern for the displaced families is the fact that they were settled in an area earmarked for a proposed biofuel project. The project is set to be driven by the Zimbabwe Bio-Energy company, a partnership between the Zimbabwe Development Trust and private investors. 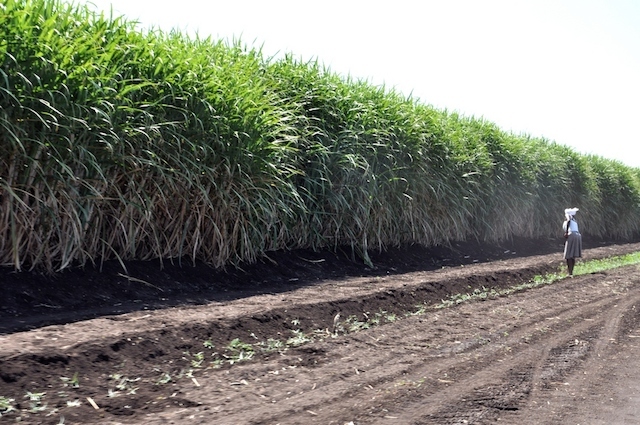 The state-owned Herald newspaper quoted the project director Charles Madonko saying resettled families could become sugarcane out-growers for the ethanol project. This plan was subject to scathing attack from rights watchdog Human Rights Watch. In a report released last month, the organisation viewed this as a cheap labour ploy. “The Zimbabwean army relocated 3,000 families from the flooded Tokwe-Mukorsi dam basin to a camp on a sugar cane farm and ethanol project jointly owned by the ruling Zimbabwe African National Union-Patriotic Front [ZANU-PF] and Billy Rautenbach, a businessman and party supporter,” read part of the report. The sugarcane plantations will be irrigated by the water from the Tokwe-Mukosi dam. Upon completion, the dam is set to become Zimbabwe’s largest inland dam, with a capacity to irrigate over 25,000 hectares. 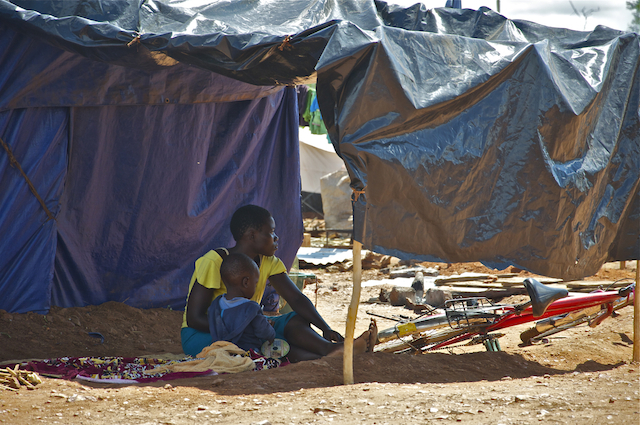 Community Tolerance Reconciliation and Development, COTRAD, a non-governmental organisation that operates in the Masvingo province sees the displacement of the 3,000 families as a brutal retrogression. The organisation says ordinary people are at the mercy of private companies and the government. “The people feel like outcasts, they no longer feel like Zimbabweans,” Zivanai Muzorodzi, COTRAD programme manager, tells IPS. Muzorodzi, whose organisation has been monitoring the land tussle before the floods, says the land surrounding the Tokwe-Mukosi dam basin was bought by individuals, mostly from the ruling ZANU-PF party. “Villagers won’t own the land or the means of production. Only ZANU-PF bigwigs will benefit,” Muzorodzi says. The scale of the habitats has posed serious challenges for the cash-strapped government of Zimbabwe. Humanitarian organisations such as Oxfam International and Care International have injected basic services such clean water through water bowsers and makeshift toilets. This issue has posed tensions at this over-populated camp. Meetings, rumour and conjecture circulate each day. Across the camp, frustrations are progressively building up. As a result, a ministerial delegation got a hostile reception during a visit last month. The displaced farmers accuse the government of deception and reneging on its promises of land allocation and compensation. The government has promised to allocate one hectare of land per family, at a location about 17 kms from this transit camp. This falls far short of what these families own in Chivi basin. Some of them, like Mazanhi, owned about 10 hectares. The land was able to produce enough food for their sustenance and a surplus, which was sold to finance their children’s education and healthcare. Mazanhi is one of the few people who has already received compensation from the government. Of the agreed compensation of 3,000 dollars, he has only received 900 dollars and is not certain if he will ever be paid the remainder of what he was promised. “There is a lot of corruption going on in that office,” he tells IPS. COTRAD says the fact that ordinary villagers are secondary beneficiaries of the land and water that once belonged to them communally is an indication of a resource grabbing trend that further widens the gap of inequality. For Moyo, daily realities at the transit camp and a hazy future is both a painful reminder of a life gone by and a sign of “the next generation of dispossession.” However, he hopes for a better future. “We don’t want this life of getting fed like birds,” says Moyo. *Names altered for security reasons. I am very dubious of the motives behind an article that attacks the government of a country that has tried to redirect some of the wealth of this country to the people of the country. Zimbabwe has been attacked by the ex and current colonial Anglo-American conglomerate because they took back their land that had been stolen by white settlers and the country suffered hugely as a consequence of that international assault. Britain made and broke promises at the Lancaster House agreement in 1979 regarding land and Zimbabwe is targeted as they want to frighten Africans in South Africa against redistributing wealth there. Whose interests does this article really serve? There are hundreds of millions of people world over suffering but they selected these people, why ?